We have a very special Runway Inspired Challenge this week. We are teaming up with CAS(E) this Sketch! So for this week, we have a Runway look and a sketch for inspiration. We also have a guest designer; the very talented Deepti Malik. Welcome Deepti! 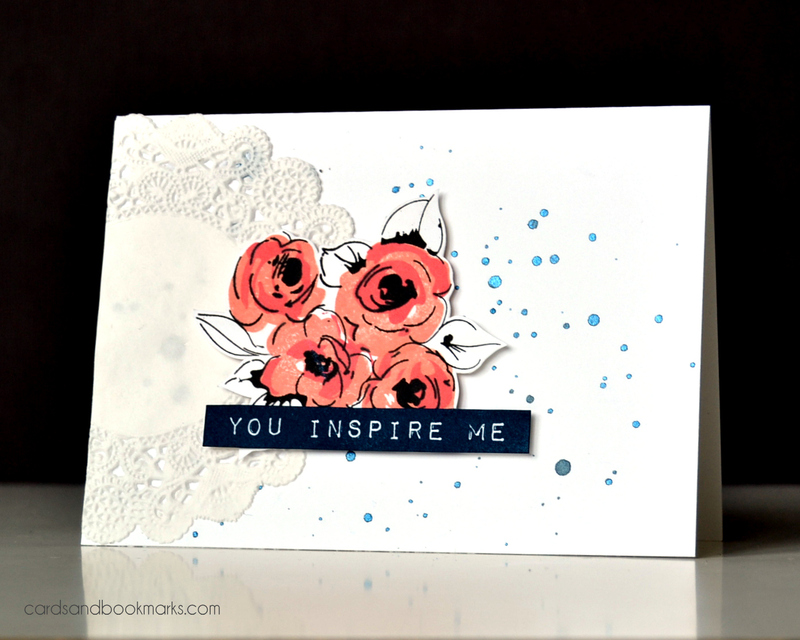 I stamped the flowers on scrap paper using Hero Arts Soft Cantaloupe and Pale Tomato inks, along with Verfine Onyx Black ink. Afterwards, I trimmed the flower cluster and adhered to the card base using foam tape. The sentiment is from the Altenew Label Love set, and was stamped with SU! Midnight Muse ink. On the card base, I splattered some ink using Heidi Swapp Navy color shine. The doily was a gift from Ellen Hutson, who is also our sponsor this week! Make sure to play along for a chance to win a $25 gift card from Ellen Hutson! And if you haven’t already, stop by the Runway Inspired Challenge for more inspiration! So pretty! I love the blue splatter and the doily! This is gorgeous! Fabulous take on the sketch & inspiration photo! Beautiful interpretation of the outfit, and love the “navy micro splatter”! I knew that you would use your Painted Flowers set with this inspiration. *wink* Totally gorgeous and fabulous Tasnim! I can’t wait to get my order! Stunning….love the use of doily and Painted Flowers!! I just love it! Beautiful Tasnim! I love that you kept the leaves black and white so the pretty flowers could stand out!